Previously sold as standalone products, the Konopka VCL Controls and Radiant Shapes are now part of the free Bonus Pack. This offer is available to update subscription customers, so current 10.1 Berlin users can now download the entire Bonus Pack for free. We recommend that you act soon if you want to take advantage of this offer, since it expires on September 30, 2016. In addition to Konopka VCL Controls and Radiant Shapes, the Bonus Pack also includes a new edition of Marco Cantu’s Object Pascal handbook (which includes a new section on weak and unsafe interface references), along with premium style packs for VCL and FireMonkey. Visit our offer page to get the bonus pack redemption links and read the terms and conditions. Continue reading to learn more about the Konopka VCL Controls and Radiant Shapes. We also include answers to common question at the end of the article. With a suite of over 200 Windows UI controls designed to make your applications more intuitive and visually stunning, Delphi and C++Builder developers can modernize, enhance, and simplify all aspects of the Windows user experience. Konopka Signature VCL Controls deliver unmatched attention to detail, ease of use, and flexibility—both for the developer and the end-user. With full VCL Styles support, deliver stunning custom and modern Windows 10 applications with ease. 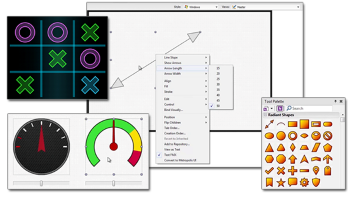 Konopka VCL Controls provide developers with many additional UI controls for their VCL applications - well beyond what is available out-of-the-box with RAD Studio. When you download this controls pack, you’ll find that it includes more than 100 different custom designers - giving you quick access to an extensive array of component customizations. For example, you can instantly access common UI elements by right-clicking on your form to bring up the context menu. We invite you to learn more about using Konopka VCL Controls in your Windows applications by watching this webinar replay. We invite you to learn more about using Radiant Shapes in your application by watching our webinar replay. Again, we invite you to visit our offer page to get the bonus pack redemption links and review the terms and conditions. Question: I previously purchased Konopka VCL Controls and/or one of the RAD Solution Pack SKUs. Am I eligible for this offer? Answer: Customers who have already purchased or redeemed Konopka and/or RAD Solution Pack are excluded from the Konopka and Radiant Shapes portion of the offer. Customers who have an active update subscription for either of these products already have access to this version. 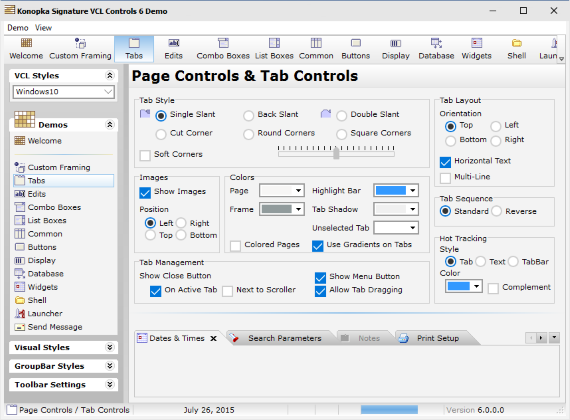 Question: How do I download and install Konopka VCL Controls? Answer: Visit embarcadero.com/radoffer and click on the redemption link. From there, you can request a license key for Konopka VCL Controls and then watch for an email containing the serial number. To install the Konopka VCL Controls, open RAD Studio 10.1 Berlin and then navigate to GetIt from the Tools menu in the IDE. In GetIt, search for “Bonus” and then proceed with the installation of Konopka VCL Controls. During installation, you will need to enter the serial number found in the email that was sent to you. Question: How do I download and install Radiant Shapes? Answer: Visit embarcadero.com/radoffer and click on the redemption link. From there, you can request a license key for Radiant Shapes and then watch for an email containing the serial number. To install Radiant Shapes, open RAD Studio 10.1 Berlin, and navigate to GetIt from the Tools menu in the IDE. In GetIt, search for “Bonus” and then proceed with the installation of Radiant Shapes. During installation, you will need to enter the serial number found in the email that was sent to you. Question: What are your future plans for Konopka VCL Controls and Radiant Shapes? Answer: The current plan is to include both Konopka VCL Controls and Radiant Shapes as part of the next release - codenamed Godzilla. Question: I just renewed my update subscription for Konopka VCL Controls. What does this mean for me? Answer: Your benefits that come with the update subscription remain the same with respect to Konopka VCL Controls. This includes contacting technical support to answer your questions about Konopka VCL Controls. The benefit of update subscription for Konopka VCL Controls or Radiant Shapes is not included as part of the Bonus Pack offer and exclusive to customers who previously purchased update subscription. Other benefits: In addition to Konopka VCL Controls and Radiant Shapes, the Bonus Pack also includes an updated version of Marco Cantu’s Object Pascal handbook and premium style packs for VCL and FireMonkey. Find out more by visiting embarcadero.com/radoffer. How do I update my Konopka VCL components to Delphi 10.2? The installer only if for 10.1 and no update anywhere! Did Embarcadero screw up, by publishing Delphi 10.2 and not have comnponents they sell updated? Please can you help me. I have already bought Delphi Professional Berlin 10.1 and i want to install Konopka VCL Bonus Pack. So i need a serial number for installation as described in the FAQ. BUT every time, when i click on the redemption link "embarcadero.com/radoffer", there i don't find such link. Where can i get the serial number?